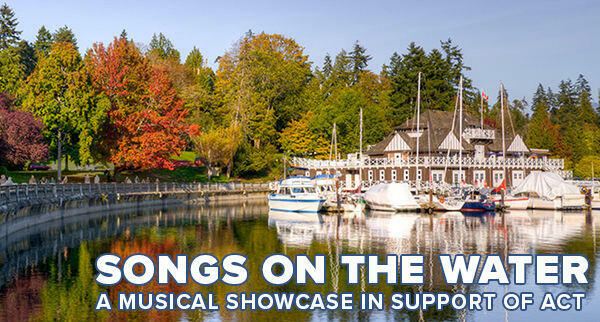 Welcome Summer 2019 at the Vancouver Rowing Club, with a very special evening of music, food, and friendship to support ACT’s free resources for the autism community. A BBQ, wonderful music, and views across Vancouver Harbour, will cater to all your senses! Join the ‘Friends of ACT’ as we celebrate the warmth of our community and the start of summer in the intimate surrounding of the Vancouver Rowing Club. Featured artists include: Melanie Dekker, Yvonne McSkimming, Ben Heffernan, Kate MacColl, and Mark James Fortin. ACT thanks the Synergy Collective Society, a community-based organization that blends art with social responsibility to support and create cooperative community programming. Each month Synergy partners with a charity to build integrated partnerships between local charities, businesses and artisans. June 4th is an opportunity for the autism community and its friends and supporters to join with Synergy for a fabulous evening. Details of Raffle Prizes – Coming Soon! A Shark Watching Cruise in Mexico for one with Nautilus Tours! Sail to the waters of Guadalupe Island off of Baja California to experience the best great white shark diving on the planet! This package includes accomodations and food on the Nautilus Belle Amie, with a spacious salon, sun deck, an expansive dive deck and, of course, a hot tub. The online auction will start May 6th. Bidding will end at the event on June 4th. ACT is looking for volunteers to help serve the dinner on June 4th. Experience is a bonus! Yvonne McSkimming is a powerful singer/songwriter who speaks to the heart with lyrics that have been described as innocent and intriguing with a voice of great depth that fills the room with beauty. She performs a combination of new songs and selected material from her CD, Place of Standing. Yvonne is also one of the founding promoters of Synergy. Her vision and passion shine through in her both her music and her work. Mark James Fortin has been described as raw, powerful, and dynamic. He performs songs that speak to the heart and mind. He is also a founding promoter of Synergy and has been performing locally with Clive’s Timings. Kate MacColl is a classically trained pianist and an award-winning performing songwriter. From 2009-2015, she was the senior songwriting instructor at the Sarah McLachlan School of Music. She has toured throughout Canada and the States, as well as played extensively in her hometown of Vancouver, performing the music she writes. London, Ontario-based award-winning solo artist Ben Heffernan displays a maturity well beyond his 18 years of age. Over the past four years, Heffernan has worked hard to hone his performance skills, playing over 150 shows around Canada, sharing the stage with artists such as Justin Nozuka and Donovan Woods, and spending countless hours songwriting. ACT – Autism Community Training is British Columbia’s leading provider of community-based professional development and parent training in autism and special needs. Since 2010, ACT has trained over 17,000 registrants, providing 143,000 hours of live training featuring leading clinicians and researchers. $21,000 in bursaries in the form of reduced registration fees for low income registrants. 350 para-professionals -staff from group homes, school districts and early intervention programs. Trained 700 registrants across five web streamed events. Reached audiences from Vancouver Island to Nova Scotia. Provided professional development to both individuals and school teams of up to 50. For a complete list of ACT’s training events, see List of ACT Events 2018. In 2018 and throughout 2019, Autism Videos @ ACT (AVA) offered nearly 40 free online videos, edited versions of our live events, at www.actcommunity.ca/videos.